опубликовано январь 3, 2019 от Дима писал Анализ рынка. В нем есть 0 Комментарий. 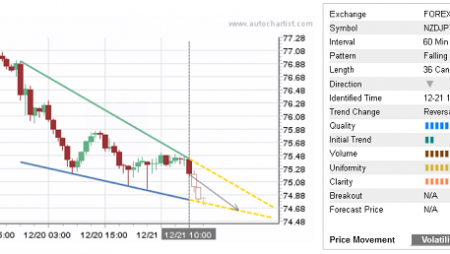 SGD/JPY continues to fall inside the daily Down Channel chart pattern which was recently identified by Autochartist. Autochartist оценивает качество этого канала вниз на уровне 6-бара - что является результатом значительного Начального Тренда (7 брусья), средняя Однородность (5 брусья) и выше четкость (6 брусья). SGD/JPY is expected to fall further inside this Down Channel – in line with the earlier breakout of the powerful support area shown below. As can be seen from the daily SGD/JPY below, the price recently broke through the key major support zone located between the support levels 80.10 а также 79.60 (which have been repeatedly reversing the price from the middle of February). This price area is acting as strong resistance zone after it was broken. 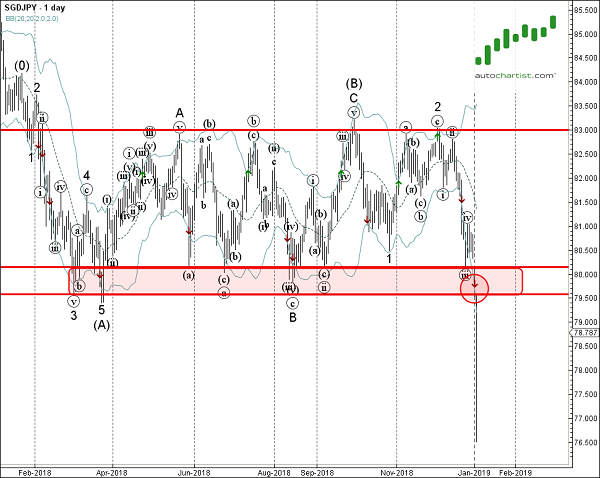 The proximity of this resistance zone increases the probability SGD/JPY will continue to fall inside this Down Channel.